Oh, how I dream of a city where the car is not king. A city designed first and foremost with the pedestrian in mind. And not just the single, able-bodied pedestrian who can dash across the street before the walk light starts to flash, but also those pushing strollers or pulling toddlers or pushing walkers, over curbs, under overpasses, across intersections, onto public transit. A city where you can ride along a bicycle path without it suddenly ending, leaving you on your own to cross an overpass and three lanes of traffic. The people at the Montreal Urban Ecology Centre (MUEC) have been doing more than dreaming: they’ve been taking action, with a project called “Green, Active and Healthy Neighbourhoods.” Begun in 2009, the project aims to redesign streets and public spaces to prioritize walking, cycling, and other modes of active transportation — one neighbourhood at a time. To this end, the MUEC has spearheaded pilot projects in four neighbourhoods: Park Extension, Mercier East, Plateau East and Southeastern NDG. In each case, the MUEC team has adopted a participatory approach involving citizens, local organizations and elected officials, who work with professionals in urban planning, urban design, architecture and other relevant fields to identify the problems in their neighbourhood and come up with concrete solutions. It’s a year-long process that culminates in the development of an action plan. The plan for Plateau East was launched yesterday. It contains over 50 recommended actions, each explained in detail. Marie-Hélène Armand, urban planning advisor at the MUEC, explained some of the proposed interventions for specific intersections or streets. Some of the simpler recommendations involve adding traffic lights, stop signs and crosswalks to improve pedestrian safety; adding planters and installing benches. Other measures include widening sidewalks (and narrowing streets), adding planting strips, or building sidewalk bump-outs to reduce traffic speed, increase drivers’ visibility, and shorten the crossing distance. A number of recommendations deal with improving the bike path network and improving cyclist safety. More complex measures involve redesigning (and rebuilding) problematic intersections or overpasses, or changing the direction of traffic on some streets. 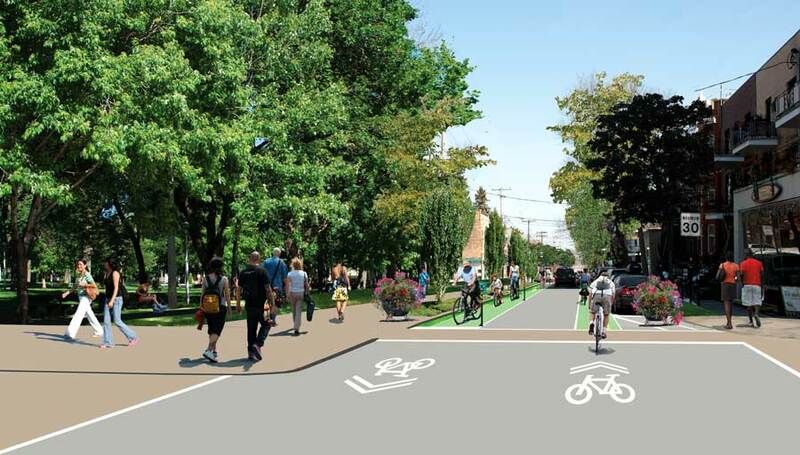 Josée Duplessis, city counsellor for the De Lorimier district of the Plateau Mont-Royal borough, said the city — which has been an active partner throughout the process — has already agreed to implement some of the smaller recommendations, and will study the feasibility of others. To this end, she announced the creation of a follow-up committee, which will include representatives and professionals from the various groups and partners involved. So what happened in Park Ex and Mercier East? Rabouin notes that real change requires four ingredients: political will, mobilization of local organizations and associations (business, health, etc. ), citizens who assert their demands, and professionals such as urban planners who are open to doing things differently. He believes the Plateau East has a good measure of all four ingredients. In Park Extension and Mercier East, where plans were launched last spring, things are moving more slowly, he admits. Yet they are moving. In Mercier East, the mayor set up a follow-up committee bringing all stakeholders to the table; the borough has now committed to building a pedestrian and cyclist crossing over the train tracks — one of the bigger and more costly requests. In Park Extension, he said, a follow-up committee has only just been created, but several local organizations have now decided to work together to push for change. The plan for Southeastern NDG is scheduled to be launched mid-June.